Transgender Day of Remembrance (TDOR) is an annual observance on November 20 that honors the memory of those whose lives were lost in acts of anti-transgender violence. You can read more about the Transgender Day of Remembrance below, and find out how you can participate. Additionally, during the week of November 13-19, people and organizations around the country participate in Transgender Awareness Week to help raise the visibility of transgender people and address the issues trans people face. What is the Transgender Day of Remembrance? 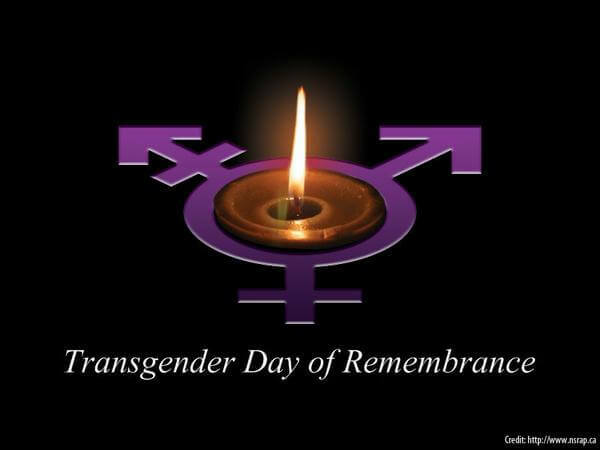 The Transgender Day of Remembrance (TDOR) was started in 1999 by transgender advocate Gwendolyn Ann Smith as a vigil to honor the memory of Rita Hester, a transgender woman who was killed in 1998. The vigil commemorated all the transgender people lost to violence since Rita Hester’s death, and began an important tradition that has become the annual Transgender Day of Remembrance.